The Glengarry is the most famous of all head gear worn with the kilt. If you decide to wear a cap with your Highland Dress, this is probably the one you will choose. It was invented by Alasdair Ranaldson MacDonell, who became the 15th chief of Clan MacDonell of Glengarry in 1788, at the tender age of seventeen. The cap is made of thick-milled woollen material, and is boat shaped thus making it easy to fold flat, it has a characteristic bobble on top with two ribbons hanging down at the back. Below you can see a photo of the cap being worn by Scottish soldiers. By 1860 it had been adopted by pipers in all Scottish regiments (except the Black watch), who retained their feathered bonnet. At that time it was usually worn without the diced border that is commonly seen on the cap nowadays. Somewhere between 1868 and 1902 it had been adopted for ordinary duty, and walking out dress, for most British soldiers. A cap which was described as "similar in shape" became the field service cap of the British army in World war II. I can remember buying one from an army surplus store, when I was about nine or ten years old. Below you can see a splendid example of the cap, being worn by a member of the Heidelberg and District Pipes and Drums, from Germany. 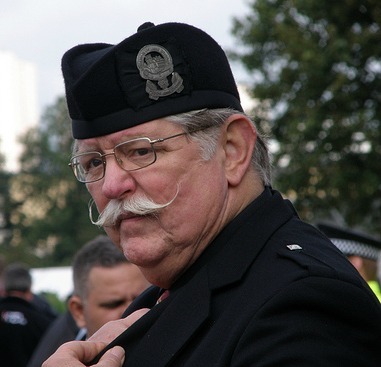 By 1914 all Scottish regiments were wearing dark blue Glengarry caps as non cerimonial dress with a diced band usually in red and white, but the bobble could be red, Royal blue or black according to the regiment. The two exceptions were the Cameronians (Scottish Rifles) who wore it in rifle green, and the Scots Guards who wore peaked caps with a diced band. It continued to be worn in dark blue or rifle green by all infantry regiments of the Scottish division. That is right up until the amalgamation of all the Scottish infantry units into the Royal Regiment of Scotland. That regiment now wear a blue version which has a red bobble, red, black and white dicing, black silk ribbons and the regimental cap badge. Although the cap is widely associated with the military, it is nevertheless worn by many civilians as part of their Highland Dress. Indeed many people don't feel their outfit is complete without one, and it is often where they like to wear their Clan badge. But of course you can wear more than a clan badge on your cap, as the next photo shows. This gentleman had chosen to wear a feather in his, as further decoration to his kilt outfit. As you will have noticed both Gentlemen in the above photos, have chosen to wear their Glengarry caps without the diced band. And as you will also no doubt have noticed, many pipers and pipe bands choose this particular cap to complete their uniforms. As with all kilt accessories the cap is a quality item of clothing, and as such is not inexpensive, but having bought the rest of your outfit I'm sure you wouldn't want to skimp on the final detail. If you would like to know where to find one in your area, or anything else to do with your kilt outfit then drop me a line using the "Contact Us" page, I am always delighted to answer your questions.